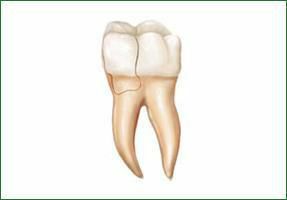 Once the permanent tooth is erupted, it takes 3-4 years for the roots to form completely. During this time, the apices of these teeth are still open are called immature tooth. Depending of the vitality of the pulp, different treatment strategies are needed. This procedure encourages the root to continue development as the pulp is healed. Inflamed vital pulp tissue is covered with medication to encourage growth. The tip of the root (apex) will continue to close as the child gets older. In turn, the walls of the root canal will thicken. If the pulp heals, no additional treatment will be necessary. The more mature the root becomes, the better the chance to save the tooth. 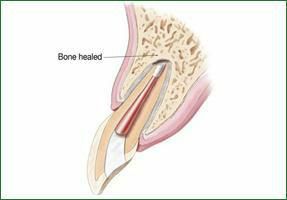 A new treatment option for infected nonvital pulp is called regenerative endodontic therapy, which involves disinfecting the root canal system, providing a matrix of blood clot into which cells grow, and sealing of the access opening. With this procedure, the root continue to thicken & increase in length thereby making the tooth stronger than teeth that received apexification therapy. In this case, the infected nonvital pulp is removed. 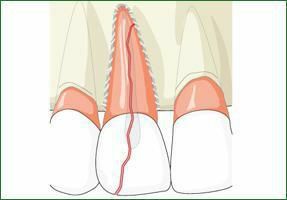 An artificial barrier is created at the tooth apex & the canal is filled with a different kind of root canal filling material. 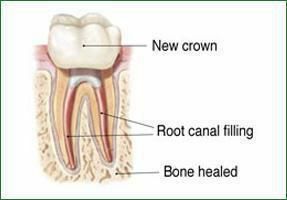 With this procedure, the roots cannot continue to develop, making the tooth susceptible to fractures. So it is important to have the tooth properly restored by your dentist.